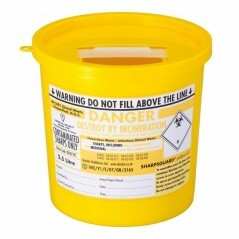 A complete range of containers for the disposal of sharps. This range has the added advantage that they can also be used to dispose of sharps contaminated with medicinal products and their residues (other than cytotoxic and/or cytostatic medicines). The range is designed to be incinerated or disposed of by other authorised process. To ensure the containers are safe and simple to use, the opaque doors clearly show when the door is in the temporary or fully closed position. Manufactured to the most stringent quality and safety standards: BS7320:1990, UN3291, AFNOR NFX 30-500 and ISO 9002.